Christmas came early for Scamp and Milo / Gee Whiskers! It really amazes me how Christmas sneaks up on a person and I think it is largely due to the fact that shops and malls start putting up decorations in October already to get people into the gift buying mood. Despite how commercial Christmas has become, I am one of those people that loves this time of the year. To me it is about spending time with those I love, reflecting on the year that has passed and appreciating all that I have. 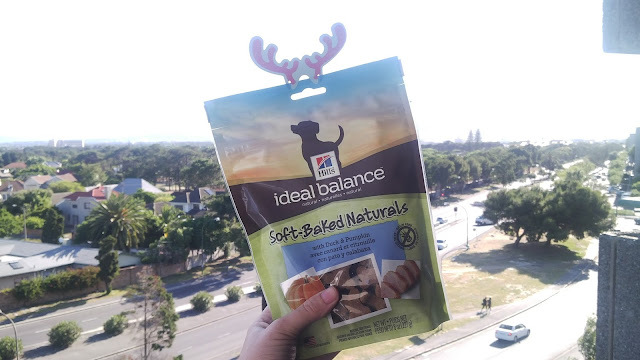 Scamp and Milo LOVE these treats and I get them these throughout the year because they are mostly meat based and free of wheat, corn and artificial preservatives. They are soft which means that they are easy to chew and perfect for older dogs who struggle to eat hard treats. These treats are available from vet shops across the country and are ideal for treating dogs without the worry of putting their health at risk. Thank you very much Hills SA for spoiling Scamp and Milo. To join a community of people passionate about their pets, join the Hill’s Facebook pagewww.hillspet.co.za/facebook or Twitter www.hillspet.co.za/twitter.